1965 At age 14, co-founded The Ides of March with schoolmates in Berwyn, Illinois. 1966 Wrote and sang The Ides’ first hit, “You Wouldn’t Listen” which reached #42 in Billboard and #7 in Chicago. 1970 Wrote and sang The Ides’ million seller “Vehicle” which reached #2 in Billboard and #1 in Cashbox. 1971 Wrote and sang The Ides’ song “L.A. Goodbye” which stayed at #1 on the WLS Chart for five weeks. 1976 Epic Records released Jim’s sol­­­­o album “Don’t Fight the Feeling”. Toured with Heart and Boston. 1977 Co-produced R&B group Essence for Epic Records. Wrote cult classic “Sweet Fools” which is now included in Cleveland International’s release: Greatest Hits 1977-1983. 1978 The JIM PETERIK BAND shifts personnel and becomes SURVIVOR. 1980-1981 Jim co-wrote hits for .38 Special including “Rocking Into the Night”, “Hold on Loosely”, “Caught Up in You”, “Wild-Eyed Southern Boys”, and “Fantasy Girl”. Also co-wrote the theme to the film Heavy Metal with Sammy Hagar. Co-wrote two albums with Henry Paul of The Outlaws. 1982 Jim and Survivor have their first million-seller with “Eye of the Tiger” – the theme from the film Rocky III, which Jim co-wrote, co-produced and played keyboard and guitar. The song, from Survivor’s third album, stayed at #1 for 7 weeks on the Billboard charts and won a Grammy™, a People’s Choice Award, and an Oscar nomination. 1984 Jim and Survivor released the platinum Vital Signs which produced three top 10 singles, “I Can’t Hold Back”,”High on You”, and “The Search is Over”. 1985 Jim co-wrote the million-selling theme for Rocky IV — “Burning Heart” for Survivor. 1986 Jim co-wrote “Is This Love” which reached the top ten for Survivor. 1988 Co-wrote all songs for Survivor’s eighth album Too Hot To Sleep – included AC. Charter “Across The Miles”. 1990 Reunited with all original members of The Ides of March for concert attended by 25,000 in their hometown of Berwyn, Illinois. Produced Indiana rock artist David Carl as well as Chicago rock band Captive Heart for later European release on MTM Records. Two of Jim’s songs, “Vehicle” by The Ides of March and “Ever Since The World Began” are featured in Sylvester Stallone’s “Lock-Up” movie. 1991 Wrote two songs for The Doobie Brothers release Brotherhood: “Under the Spell” and Divided Highway”. Wrote end-title theme for John Candy’s “Delirious” movie-“Beyond Our Wildest Dreams”. Wrote songs for Atlantic recording act Tangiers and Co-wrote songs with Tom Littlefield for the EMI group, The Questionnaires. Renewed writing with .38 Special — co-wrote “Rebel to Rebel” and The Sound of Your Voice” for their “Bone Against Steel” release. 1992 Recorded Ideology with The Ides of March — a rerecording of their hits plus four new songs. Produced and co-wrote four songs for Chicago artist Cathy Richardson’s album “Moon Not Banana”. Co-wrote “Space & Time” with King Crimson/Asia bassist/vocalist John Wetton for his 1993 solo release “Battlelines”. 1993 Reunited with Survivor for European and American tour. Released greatest hits package with two new songs that Jim co-wrote “You Know Who You Are” and Hungry Years”. Co-wrote two songs for Cheap Trick’s “Woke Up With a Monster ” album. 1994 Co-wrote and co-produced album with Christian artist Also recorded second album for David Carl. Produced R&B Act A.S.A.P. for Legacy Records. 1996 Songwriting in Nashville with Skip Ewing, Troy Seals, Dave Gibson, Max D. Barnes, John Greenebaum, and others. Wrote “Nobody’s Fool” with Henry Paul for Blackhawk’s 1997 release, “Love and Gravity”. Performed solo as featured opener for The Beach Boys, REO Speedwagon and Credence Clearwater. Performed at a sold-out solo show at Nashville’s legendary Bluebird Cafe. 1997 The Ides of March expand their calendar performing for thousands on the Midwest’s vital festival scene. Releases “Age Before Beauty” E.P. which includes “Moon Out Of Phase” and the Milwaukee Bucks theme song “Friendly Stranger” – an instrumental adaptation of “Vehicle”. .38 Special released Resolution which featured 10 collaborations with Jim including their top 15 charting “Fade to Blue” which becomes a permanent fixture on rock radio in the summer of 1997. 1999-Jim co-writes “Finally Next Year” in tribute to the Chicago Cubs, which is played at all games at Wrigley field, and is included on an album sold at all major-league ballparks. 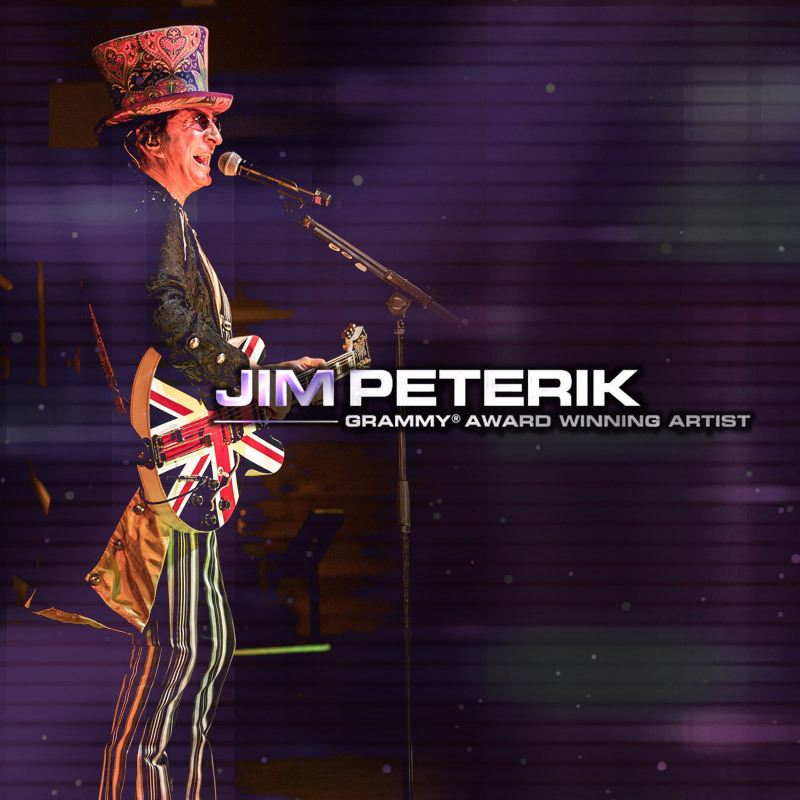 2000 releases solo album project Jim Peterik & World Stage featuring Jim and many of the artists he has had the pleasure of working with in the past. Mounts first sold out WORLD STAGE concert, featuring many of the participants of the album. Produces and co-writes the MECCA album which becomes a huge European hit. 2004 The IDES OF MARCH celebrate their 40th year together with a multi-media concert recorded on video, which becomes the Ides first DVD release. PRIDE OF LIONS release “The Destiny Stone” which has even greater success that the debut, and receives rave reviews. Jim and Toby Hitchcock tour Europe. 2006-Jim releases 2nd solo album “Above The Storm” on Frontiers Records. The Ides of March’s first two Warner Brothers Albums “Vehicle” and “Common Bond” are re-released on Collector’s Choice Records. The Ides are featured in the “Extended Play” series of Live albums released nationwide on Sony Records. The Pride of Lions Belgian Concert DVD of is released. Jim’s song “The Search Is Over” is featured in a new smash musical onstage in Los Angeles. “Eye Of The Tiger” is among the top downloaded songs of all times on iTunes. Jim continues to write with the top Nashville Songwriters. Pride Of Lions makes its US Concert Debut in Chicago ILL on OCT 7. 2007-PRIDE OF LIONS-“The Roaring Of Dreams” is released to critical acclaim and strong sales in Europe and Japan. The seventh annual WORLD STAGE concert played May 18th at the Hemmens Auditorium in Elgin, Ill. WORLD STAGE rocked the Lokeerste Festival, Belgium in August. Jim reunites with former Survivor vocalist JIMI JAMISON for a new recording project. 2008-Jim is featured in ads in Guitar Player magazine for the new Leslie Guitar Jim introduces “Lifeforce” a smooth-jazz concept and plays dates with the Lifeforce band., who releases their first CD. The band plays the Kettle Moraine Jazz fest, and a concert at the Beverly Arts Center. An expanded “World Stage” show is captured by Public Television’s “Soundstage” for national broadcast during their 7th season. Joining Jim are Jimi Jamison and Dave Bickler from Survivor, Don Barnes and Donnie VanZant from .38 Special, Johnnie VanZant from Lynyrd Skynyrd, Martha Davis from the Motels, Night Ranger, Mickey Thomas from Starship, Ray Parker, Jr. , and The Ides Of March. the Ides continue their unprecedented 44th year together with a full schedule. The Jimi Jamison album “Crossroads Moment”, produced and co-written by Jim is Released on Frontiers Records. 2010-Jim appears regularly with Lisa McClowry is support of “Time Signatures”, The Ides Of March receive the honor of having a street named after them in the band’s (And Jim’s) hometown of Berwyn, The Ides release “Still 19” (re-titled from “Keep Rockin’) the first CD of entirely new music by the band in 17 years and continues touring. “Songwriting For Dummies” achieves “Best Seller” status and goes into an updated second printing.Jim appears at an LSU football game to sing “Eye Of The Tiger” with the LSU marching band, and is subsequently inducted into the Louisiana Music Hall Of Fame. Jim continues to scout and mentor young talent, including a pair of young opera singers with a unique crossover into pop, and songwriter Mallory Lennon. 2011-Jim continues his exploration into Smooth Jazz, recording the second Lifeforce Album “Forces At Play” with a number of Smooth Jazz stars such as Mindi Abair, Steve Cole, Nick Colionne and Jim appears throughout the country at various Smooth Jazz festivals and concerts. “Songwriting For Dummies” enters its second printing. Jim’s song “”The Search Is Over” is featured in the Broadway hit “Rock Of Ages”. 2012- A new Pride Of Lions album “Immortal” is Jim also at work on his Autobiography. A lifelong Beach Boys fan, Jim fulfilled a career dream in 2012 co-writing “That’s Why God Made The Radio” for the California legends. The single turned out to be the highest charting single of their career. 2013-Jim is featured in a BBC Documentary “Songs That Shook The World” Jim puts finishing touches on his autobiography “Through The Eye Of The Tiger- A Survivor’s Tale”. Tours China as a part of the Grammy Winner’s series of concerts in Lifeforce’s “Forces At Play” is released in a Special double-disk deluxe remastered edition featuring a new track “Voice Of America” and a live duet of Jim’s Ides Of March classic Vehicle with Blues Legend Buddy Guy. Produces teen sensations Ariel, Zoey and Eli. in addition to hosting the TV pilot “Steal The Show” documenting behind the scenes action of Jim with them in the studio. Continues to co- produce new country artist Andrew Salgado. Produces 17 year old country phenom Hunter Cook. 2015-Produced “Risk Everything” (Frontiers Records) with new artist Marc Scherer. Video of Marc and JP “Cold Blooded” released, featuring the original Girl (LeeAnn Marie) from Survivor’s 1984 “I Can’t Hold Back” Video. Wrote 5 songs for Jimi Jamison/Fergie Frederiksen Memorial CD “Torch”. Co-produced/compiled new Ides Of March 5-disc CD/DVD Box set, along with writing/co-writing 3 new songs for that set. Contributed/co-wrote a track for the new Brian Wilson Solo Album “Pier Pressure” entitled “Sail Away”. Plays with PRIDE OF LIONS in Milan Italy. Co-hosts “American Garage-The Cornerstones Of Rock” for Public Television featuring the top Chicago groups from the 1960’s and 1970’s. The Ides Of March are the “house band” for the show. The Pledge Breaks for the PBS Broadcast on WTTW-TV feature Jim, and the event results in a record-breaking total. 2017-Jim started writing again with Brian Wilson with Producer Joe Thomas and Larry Millas for his next album and documentary on his life. 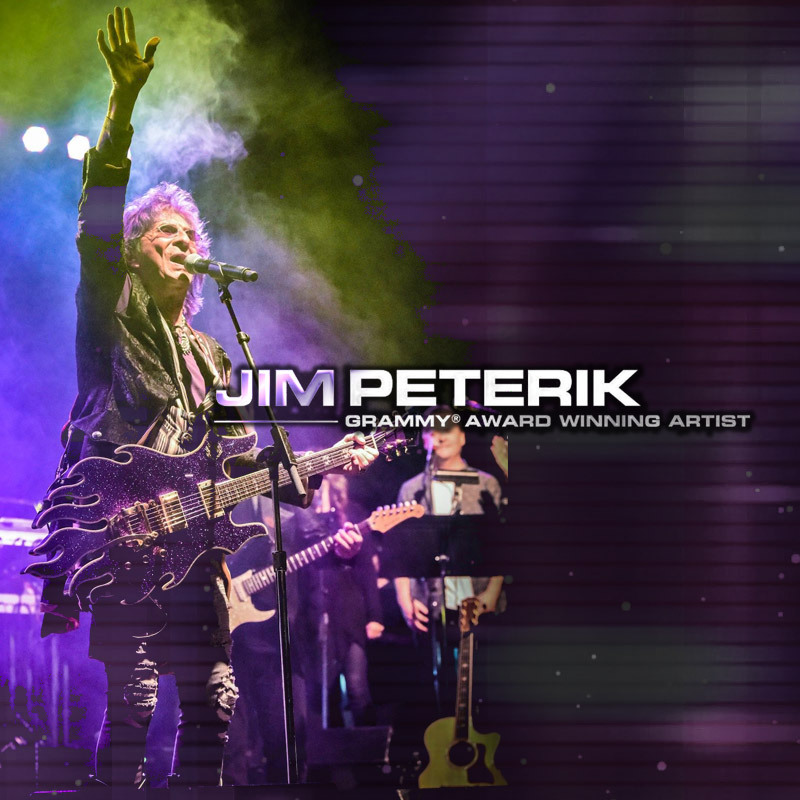 Jim began writing with Dennis DeYoung former lead singer- songwriter of Styx. 2018-Jim began writing with 38 Special for a new album. 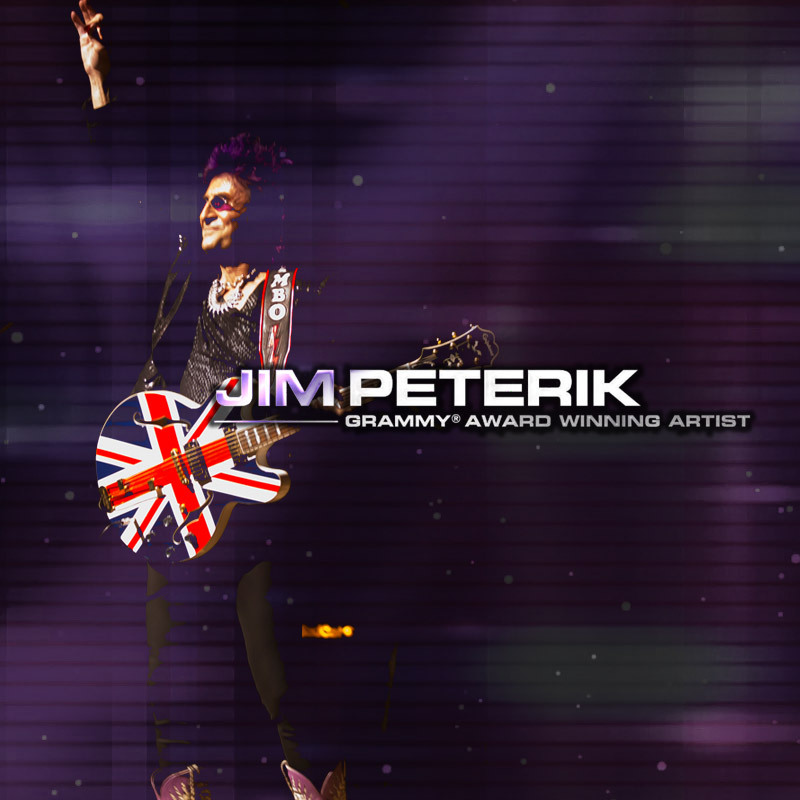 Began pre-production for a new Jim Peterik and World Stage album featuring Jim with guest artists from all over the world. Pre-Production for an all new Ides Of March album for early 2019 release. Jim is also starting to do presentations around the world- a career retrospective of Jim’s 55 years on the front lines of rock & roll. Currently is touring with the Ides Of March; the Cornerstones of Rock featuring the best of Chicago rock bands from the golden 60s including the Ides Of March and the Buckinghams, New Colony Six, Shadows Of Knight, Cryan Shames and more. 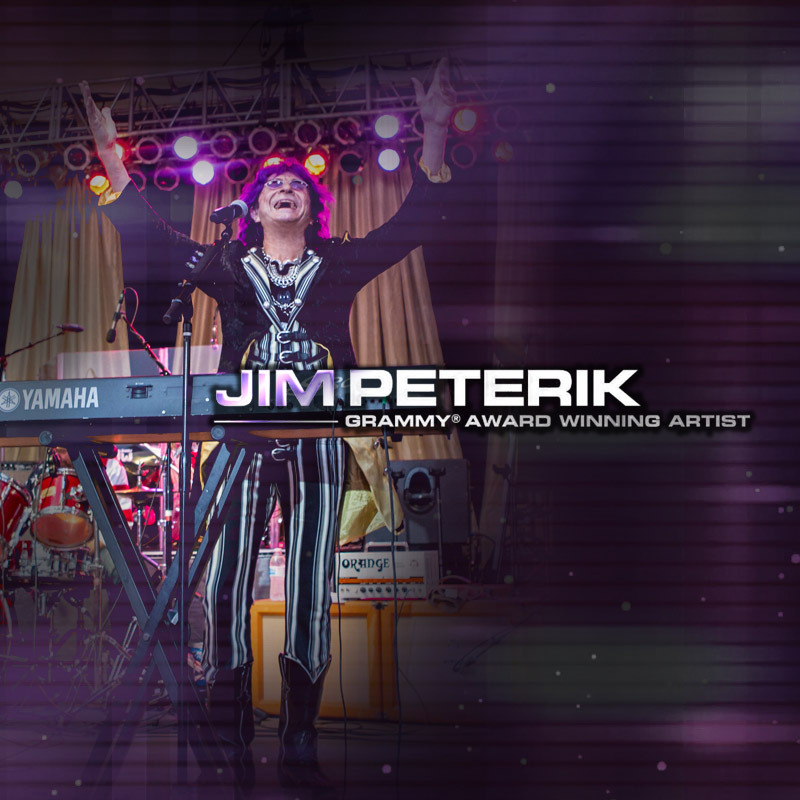 Also Jim is doing shows with Jim Peterik and the Storm Chasers in support of his album The Songs. The Jimmy Bar company launches the “Eye Of The Tiger” energy bar; co-formulated by Jim Peterik. The bar can be found at major retailers nationwide. 2019-The Ides Of March complete a new album entitled “Play On” celebrating 55 years together; with a stellar cast of guest artists, including Mark Farner, Paul Shaffer, Joe Bonamossa, David Pack, Cathy Richardson, Bo Bice and Mindi Abair. The new World Stage album “Winds Of Change” will be released worldwide on Frontiers Records in April The first video “Proof Of Heaven” with special guest Dennis DeYoung will premiere in March 2019. 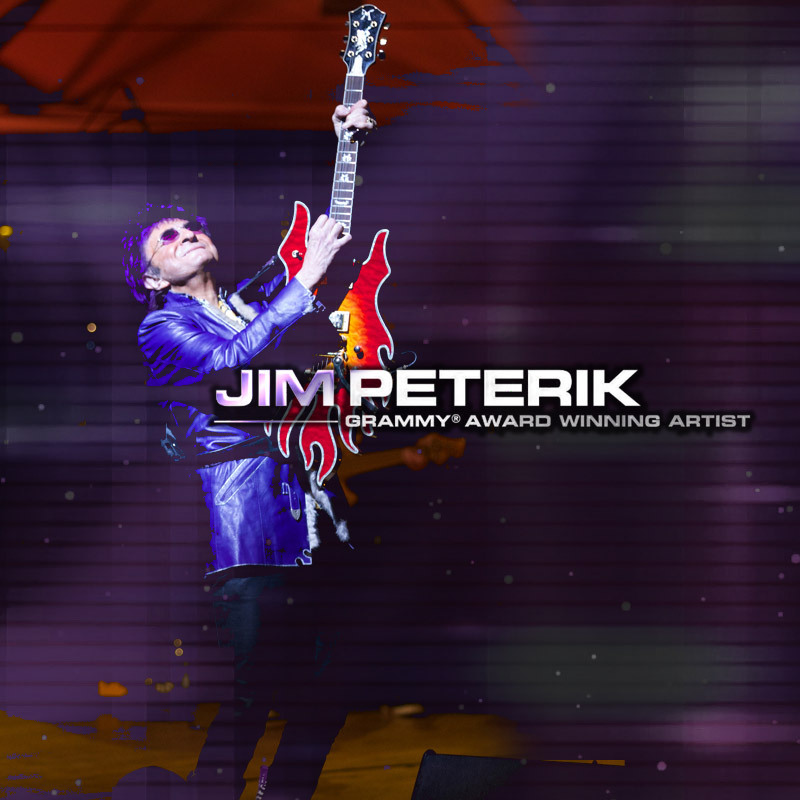 Jim Peterik is a survivor. Those words were prophetically spoken first on the back of his first solo album “Don’t Fight The Feeling” back in the seventies. In the decades since, Jim has lived up to that term. Jim’s home base has always been The Ides Of March, where Jim wrote and sang the evergreen hit “Vehicle”. The Ides began their journey in 1964, and continue today as a vital, touring act; featuring all the original members. In the seventies, Jim combined his love for melody and driving rock with the band Survivor. Their phenomenal rise to the top was borne on the back of the amazing songs Jim co-wrote. “The Eye Of The Tiger” from the film “Rocky III” has become an indelible classic, and garnered Jim Grammy™ and People’s Choice awards; as well as an Oscar™ nomination. Other Billboard chart-toppers followed, including “The Search Is Over”, “High On You, and “I Can’t Hold Back”. Further hits from films followed. “Burning Heart” from “Rocky IV” topped the charts; and Jim co-wrote the theme of the seminal animation classic “Heavy Metal” with Sammy Hagar. A long lasting and fruitful relationship started in 1980 between Jim and the southern-rock group .38 Special. Jim co-wrote their platinum hits “Hold On Loosely”, “Caught Up In You”, “Wild-Eyed Southern Boys”, “Fantasy Girl”, and “Rockin’ Into The Night”. Their collaboration continues to this day. Jim has also written with the beloved Lynyrd Skynyrd. The turn of the century saw the genesis of World Stage, an ongoing project bringing Jim and artists with whom he has had a history as either co-writer or touring, for live shows and recordings. The World Stage shows also showcases fresh talent Jim mentors. The new World Stage album “Winds Of Change” will be released worldwide on Frontiers Records in April 2019. The first video “Proof Of Heaven” with special guest Dennis DeYoung will premiere in March 2019. Jim Peterik has never lost his verve for Melodic Rock, a style of music he helped forge. His group Pride Of Lions tours the European continent regularly, and their albums and DVDs are best sellers. The latest Pride Of Lions album “Fearless” was released on Frontiers Records in 2016. Expanding (but not too far) from the musical realm in 2002, Jim co-authored “Songwriting For Dummies” This book distilled a lifetime of successful songwriting into simple language, and shed light on some of the arcane wisdom of writing songs. In the years since the Book has achieved Best Seller status and has recently gone into its second printing, with a major update. In September of 2014, Jim’s Autobiography “Through The Eye Of The Tiger” was released. The book traces Jim’s path from humble beginnings in Suburban Chicago to his stellar career as a platinum hit Songwriter, successful Musician and in-demand Producer. A lifelong Beach Boys fan, Jim fulfilled a career dream in 2012 co-writing “That’s Why God Made The Radio” for the California legends. The single turned out to be the highest charting single of their career. On October 16th 2015 (the 50th Anniversary of the Ides Of March) Jim hosted American Garage-The Cornerstones Of Rock, a Public Television concert featuring the Ides Of March and other essential Chicago rock groups. The special garnered the highest ever pledges for WTTW, (Chicago’s PBS station), with Jim co-hosting the pledge breaks. The live concerts highlighting the “Cornerstones” cast continue to sell out whenever and wherever they are mounted. In 2016 Jim released “The Songs”, taking his top hits to Nashville in an entirely new light, working with some of Music City’s greatest. The accompanying shows sold out in a hurry. 2018 saw the launch of the “Eye Of The Tiger” energy bar, in conjunction with the Jimmy Bar company; co-formulated by Jim Peterik. The bar can be found at major retailers nationwide. The future continues in overdrive for Jim. The Ides Of March will release a new album entitled “Play On” in 2019, with an impressive lineup of guest artists, celebrating 55 years together. The Ides continue to thrill audiences everywhere with their hit-packed shows (featuring the platinum gems Jim wrote or co-wrote). Jim remains a high demand writer, producer, and solo performer traveling worldwide; with diverse projects always in the pipeline.